A popular argument I hear from people who don’t like to use natural cleaning products is that they don’t work as well as those with harsher chemicals. And lets face it, when it comes to certain things, you really want them to be clean. However, for those of you who trust in your natural ingredients, you can rest assured that you can be green AND clean. I decided to conduct my own test and got some of the Wave High Performance Dishwasher Gel. (I have been a long time fan of their Furniture Polish seen here.) As for the results, while I may not be a consumer testing expert, there was no visible difference to me. My husband (an occasional skeptic) even agreed that the dishes washed with the Earth Friendly Products were just as crystal clear and clean as when we use less natural products. So if you are skeptical of how clean green products can be, I suggest you conduct your own study. You may just be pleasantly surprised how clean your house (and conscience) will be! Ok, we tried the 7th Generation dishwasher gel. It did clean, but left a lot of film on all the dishes. I may have to try this! thanks for the tip! We bought wave and now when we run the dishwasher foam pours out the front and our dishes have never been dirtier. Rocky, I am sorry to hear you had such a bad experience with this product! I strongly recommend that you contact the manufacturer and let them know that this happened. I’ve tried nearly every “green” automatic dishwashing fluid and the Wave 2x Ultra is by far the best. For you skeptics, try using the Wave 2x along with the Wave Rinse agent (they say you don’t need it, but I’ve found it makes a difference in the final rinse). 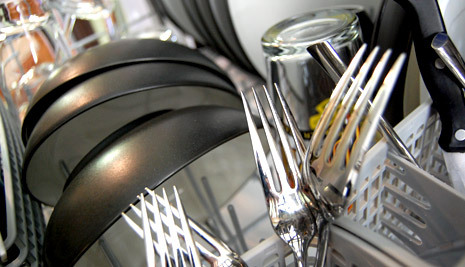 My dishes have NEVER been cleaner, even when I used the toxic stuff. I almost got a new dishwasher, because nothing was getting clean. Then I found Wave. For what it’s worth, I’ve never been impressed with any of the 7th Generation products. Their marketing and packaging seem to be top-notch, however. Maybe there’s a relationship there?